Manhattan Community Board 9 encompasses the West Harlem neighborhoods of Morningside Heights, Manhattanville, and Hamilton Heights. Extending from 110th Street to 155th Street, our boundaries are Cathedral Parkway on the south; 155th Street on the north; Manhattan, Morningside, St Nicholas, Bradhurst, and Edgecombe Avenues on the east; and the Hudson River on the west. We consider each neighborhood a village, a community unique in its own way, rich in cultural diversity and steeped in historical significance. These three distinct neighborhoods that comprise Manhattan Community Board 9 illustriously reflect the past, the potential, and the promise of West Harlem. Morningside Heights, in the southern portion of the district, has been dubbed the “acropolis of the new world” for its concentration of world-class institutions and architecture. It contains many of New York City’s prestigious educational institutions: Bank Street College, Barnard College, Columbia University, Teacher’s College, and The Manhattan School of Music. This West Harlem village is also where you find The Cathedral Church of St. John the Divine, The Jewish Theological Seminary, Union Theological Seminary, The National Council of Churches, and Riverside Church. Morningside Heights is also home to the Grotto Church of Notre Dame and to St. Luke’s-Roosevelt Hospital. At its northernmost end sit two large housing complexes: the General Grant Public Housing Development and Morningside Gardens. Morningside Heights is flanked to the east and west by Morningside and Riverside parks, both designated as historic scenic landmarks. Manhattanville comprises the central area of our district, beginning at 122ndStreet and extending northward to 135th Street. This original Dutch settlement sits in a valley, and during the Revolutionary War it was called Hollow Way. It is the site where the main action of the Battle of Harlem Heights began under the command of General George Washington. In 1806, the village of Manhattanville was established around the crossroads of Bloomingdale Road and Manhattan Street, now known as Broadway and 125th Street. 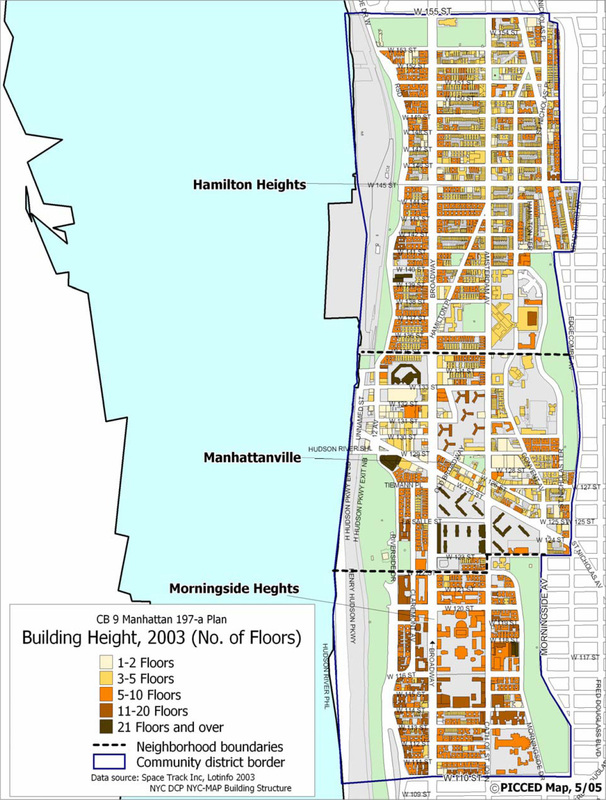 Manhattanville includes the south campus area of The City College of New York, the Manhattanville Housing Development, the Riverview Towers/Riverside Community Housing (3333 Broadway), and numerous small commercial establishments. Manhattanville is also the site of Columbia University’s planned new campus expansion. Traveling uptown, you come to Hamilton Heights, the northernmost section of MCB9. Part of this area was recently designated the Hamilton Heights/Sugar Hill Historic District. Sugar Hill got its name because residents from areas of central Harlem aspired to move up the hill to the part of town where lavish brownstones, spacious apartments, and buildings of sound architectural structure and enviable design abounded; moving up the hill meant you had made it to the land where the living was sweet. Riverbank State Park, Dance Theatre of Harlem, The City College of New York (North Campus), Hamilton Grange, and the soon-to-be-erected Faith Ringgold Children’s Museum for Art and Storytelling are located in this village.